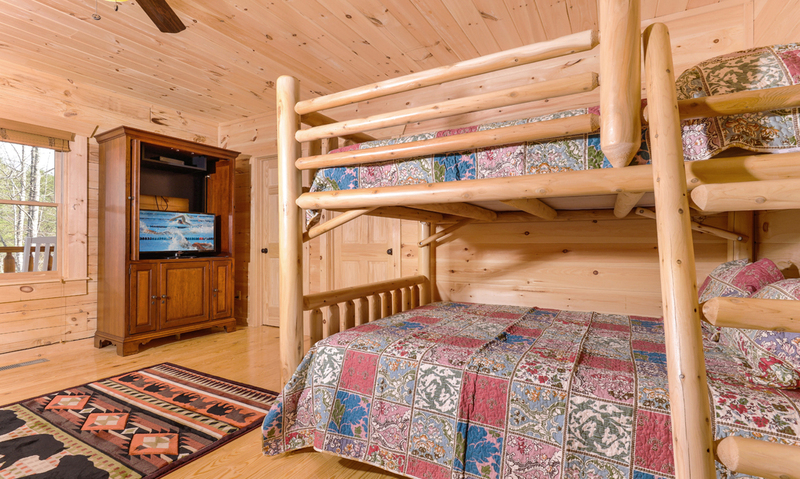 A 5- bedroom, 5 ½- bathroom cabin with 4,200 square feet, Splish Splash is great for group getaways. 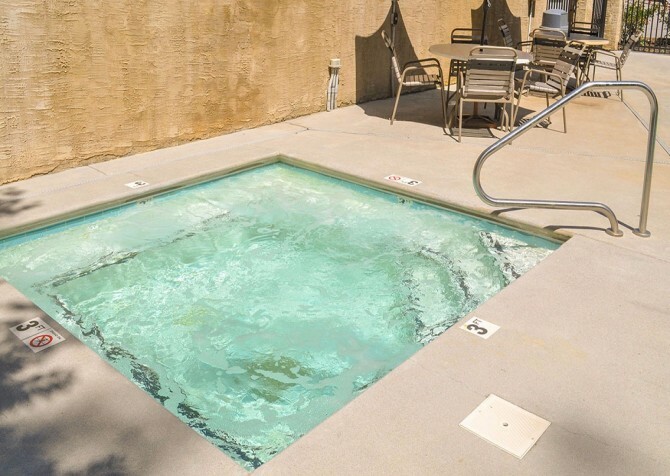 It boasts mountain and wooded views, a great location in Pigeon Forge, and lots of amenities – including a heated private indoor pool (3-4 feet deep)! Its location in Sherwood Forest includes community pool access, and with room for 22 guests, it offers plenty of space for families and friends to play and relax together. 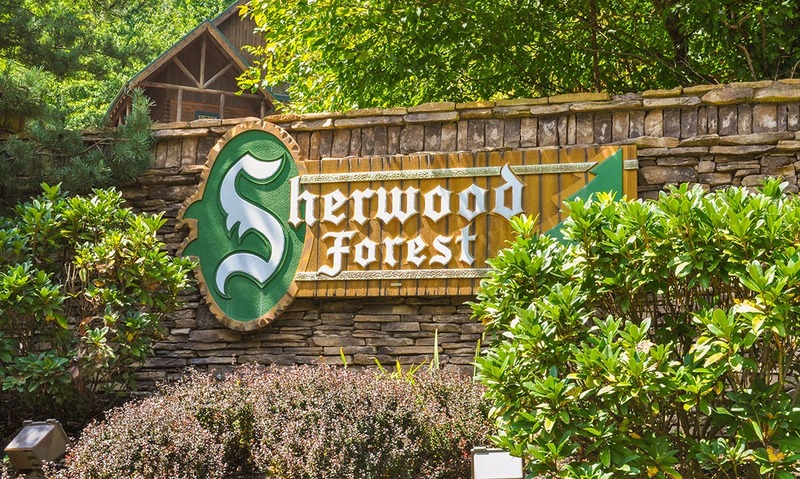 A town known for its family-friendly attractions, beautiful mountain scenery, and outlet shopping, Pigeon Forge offers something for every member of your group. Those who love a bargain will appreciate a day at the Tanger Outlets, and kids (and kids at heart) will love the attractions – from laser tag and go karts to miniature golf and the famous Dollywood. 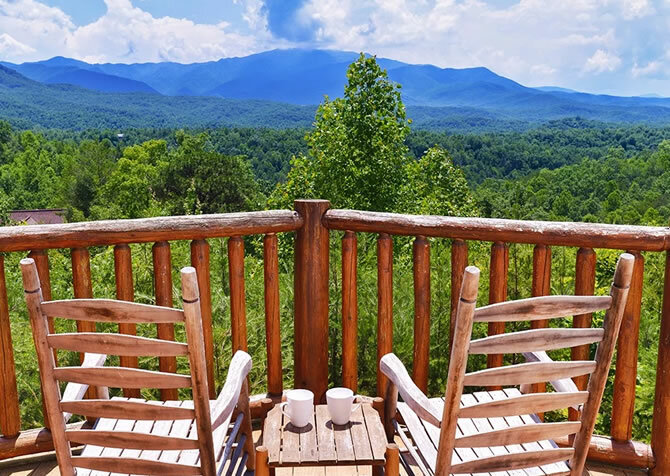 The Parkway, the main street through Pigeon Forge, is also home to dozens of great restaurants that span the globe – Italy, Germany, Mexico, America, and more. You can grab a quick lunch of burgers or wings, have a delicious steak or seafood dinner, or load up on all your favorite breakfast foods at one of the many pancake houses. 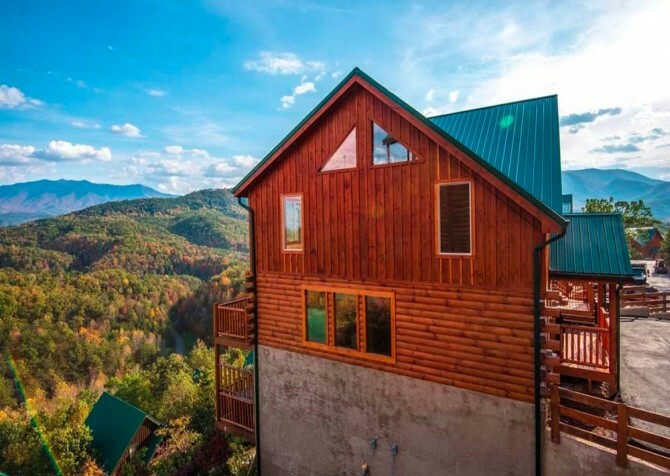 All of this is set in front of the stunning backdrop of the Great Smoky Mountains, with an abundance of flora and fauna not found many other places. 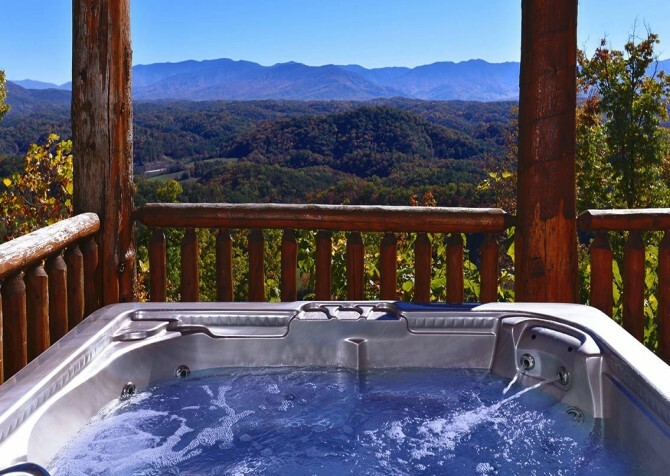 Gatlinburg is also nearby, and it boasts more great attractions and restaurants, tons of shops with lots of great gifts, and the entrance to the Great Smoky Mountains National Park. 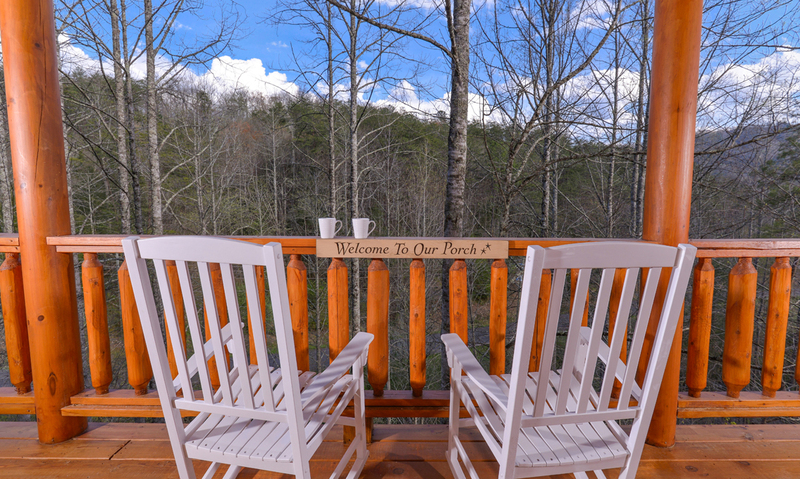 You could spend an entire day (or more) exploring here. The park has hundreds of miles of trails, beautiful waterfalls, and lots of opportunities for outdoor fun. After busy days in town, you’ll appreciate the comfort of Splish Splash. 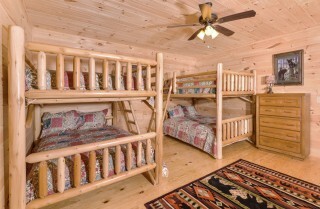 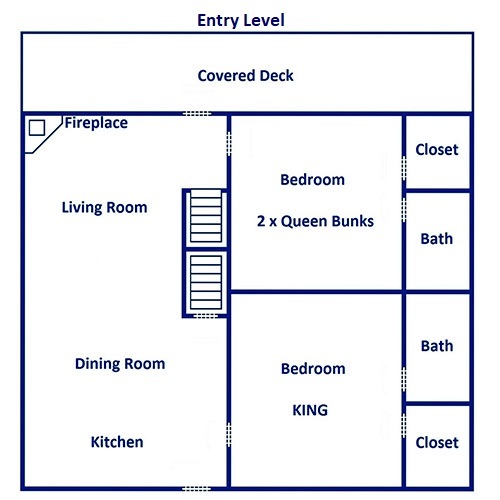 It has 4 king-size beds, 4 queen-size bunk beds, and 3 queen-size hide-a-beds. 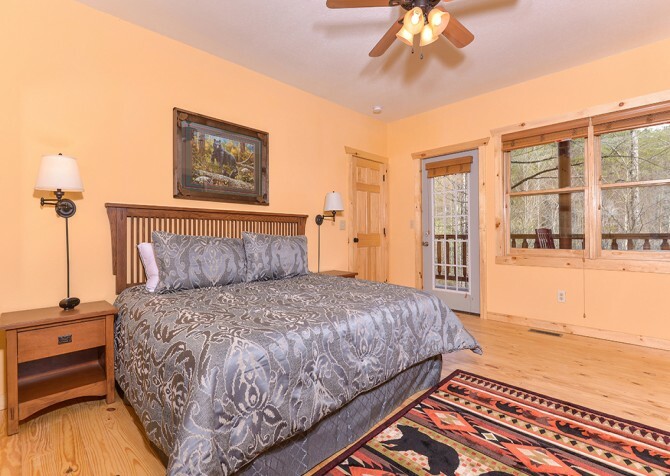 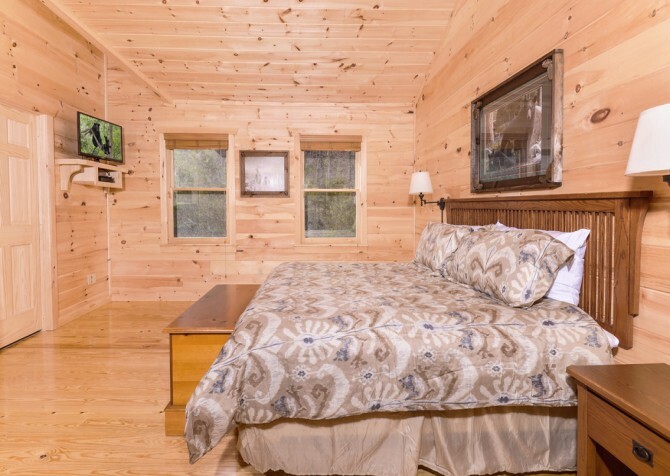 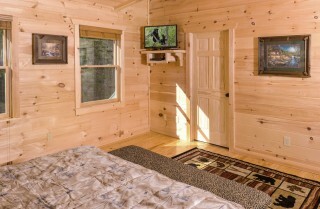 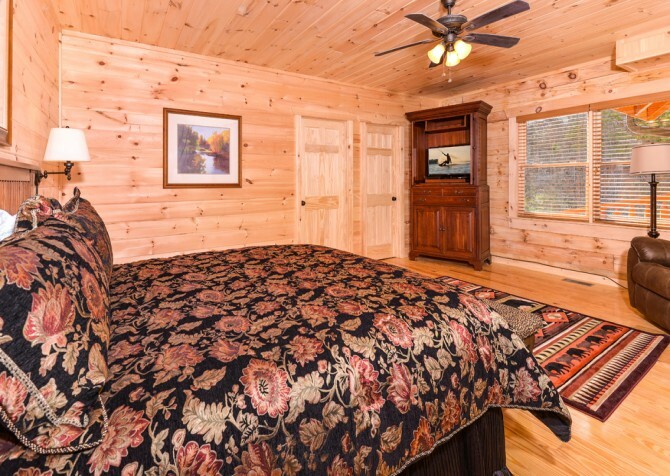 You can relax in these comfortable bedrooms as you enjoy the peace of the mountains or fall asleep watching your own TV. Each guest will have a relaxing retreat, and with five-and-a-half bathrooms, getting ready for time in town will be a breeze. 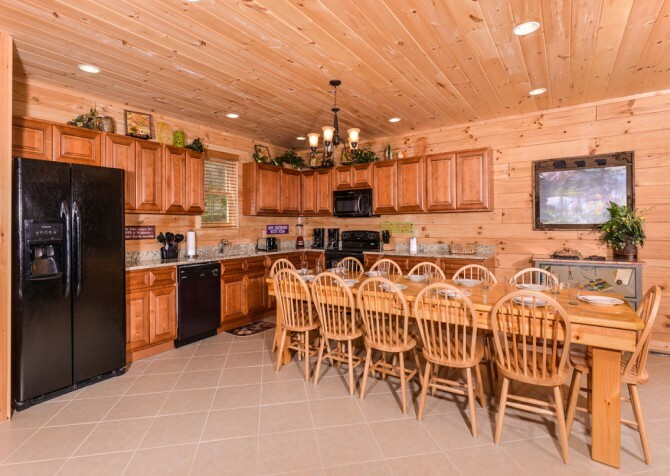 There are also lots of great communal spaces in this lovely cabin, so everyone can spend time visiting, playing, cooking, and relaxing together. If you’re a group that prefers cooking rather than eating out, the fully-equipped kitchen will provide just what you need. It is furnished with full-size appliances and plenty of utensils, cooking tools, and dishes for preparing and enjoying meals in the cabin. 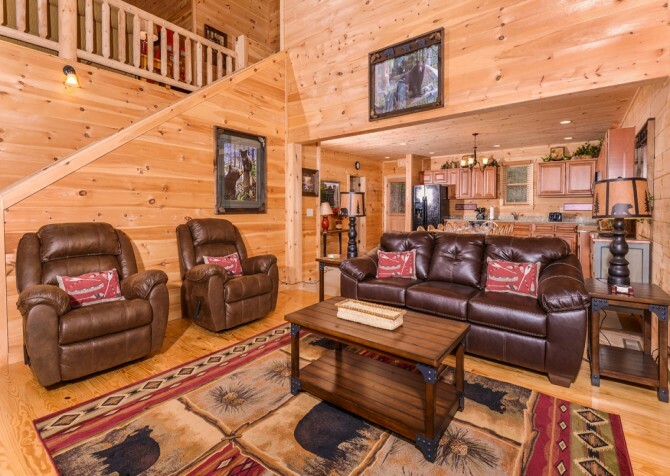 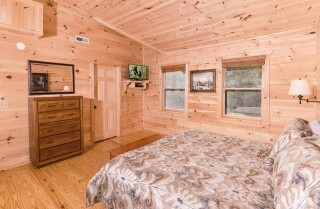 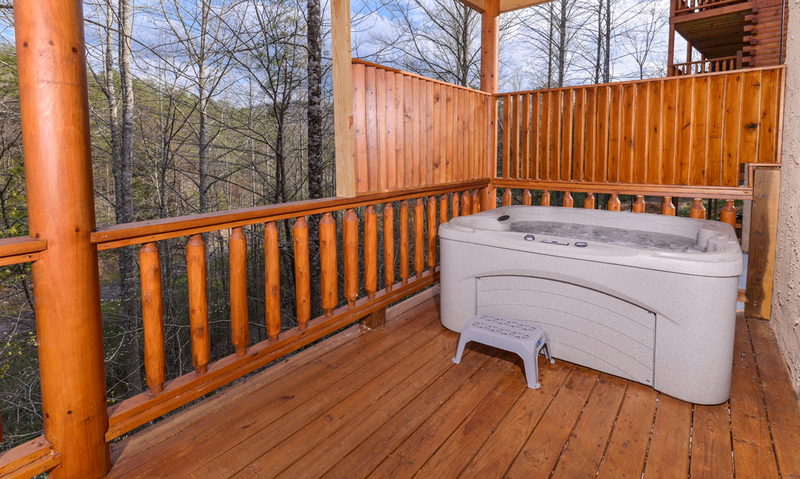 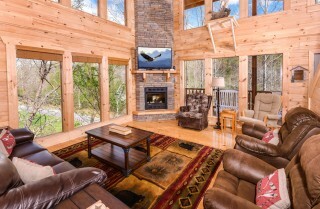 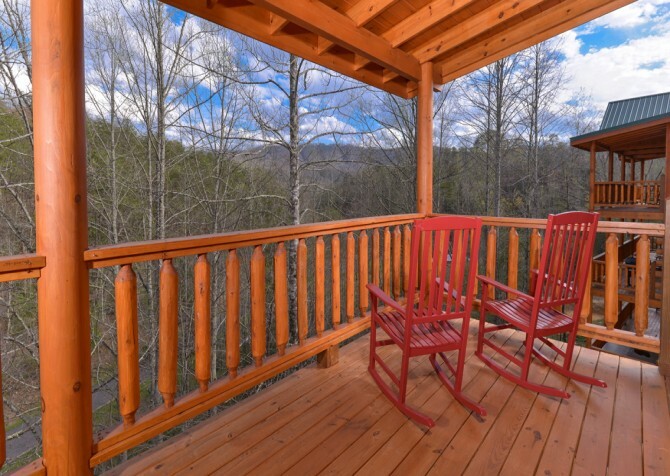 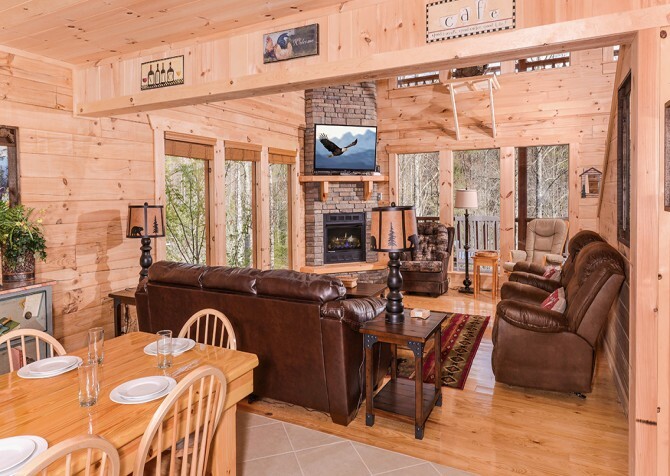 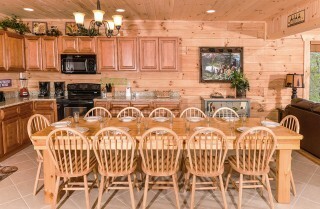 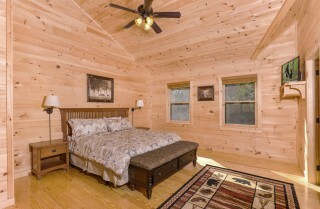 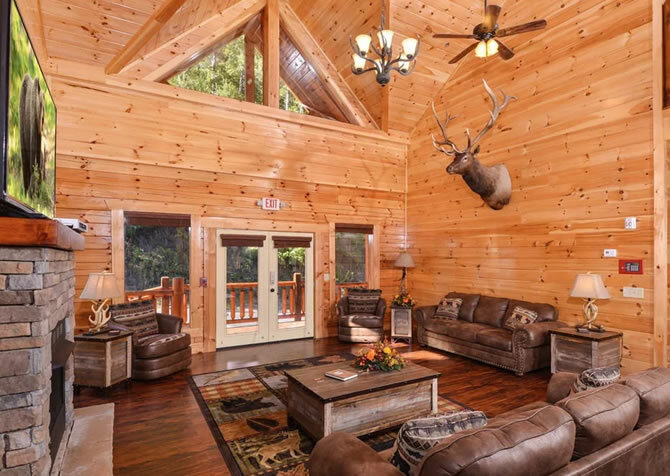 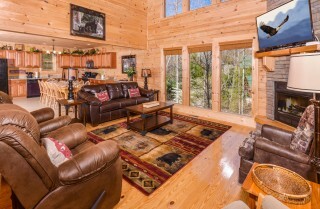 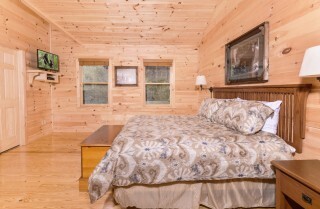 Once you’re done eating, enjoy everything else this awesome Pigeon Forge cabin has to offer. 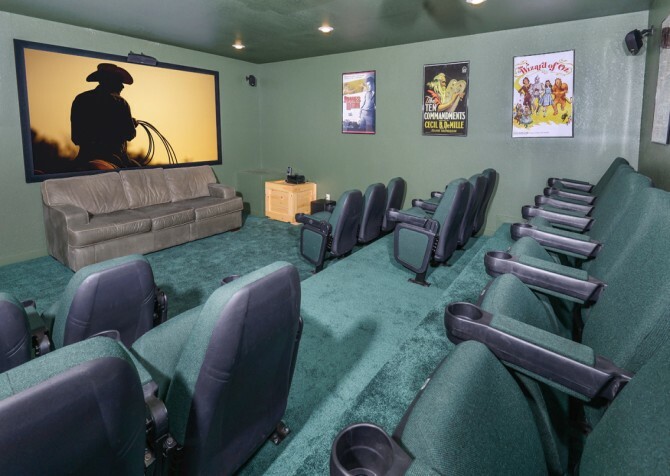 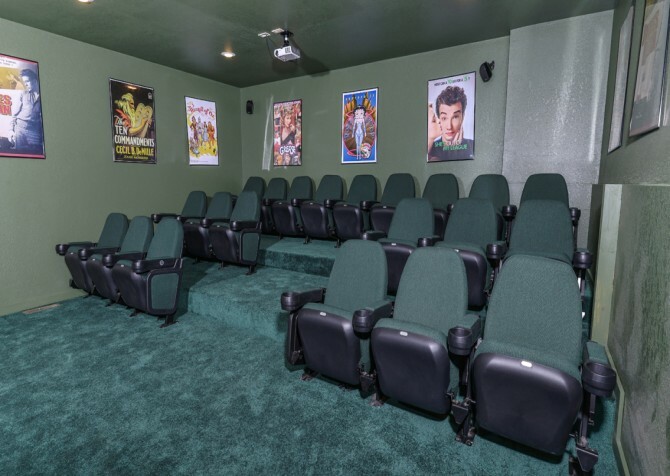 Great for entertaining groups, Splish Splash boasts a home theater room with a big screen TV and DVD and Blu-ray players. Flip on the TV to watch a ballgame, watch your favorite nightly sitcoms, or gather around the TV for a family movie night. 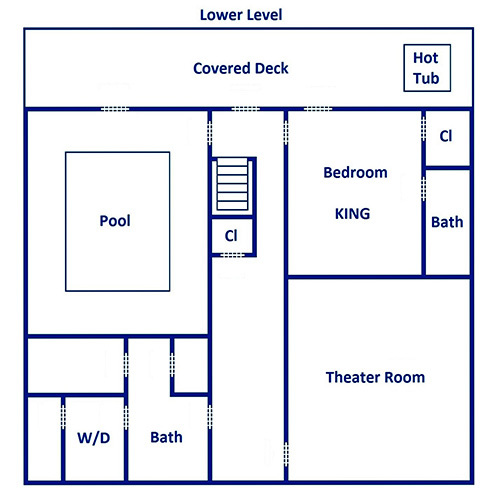 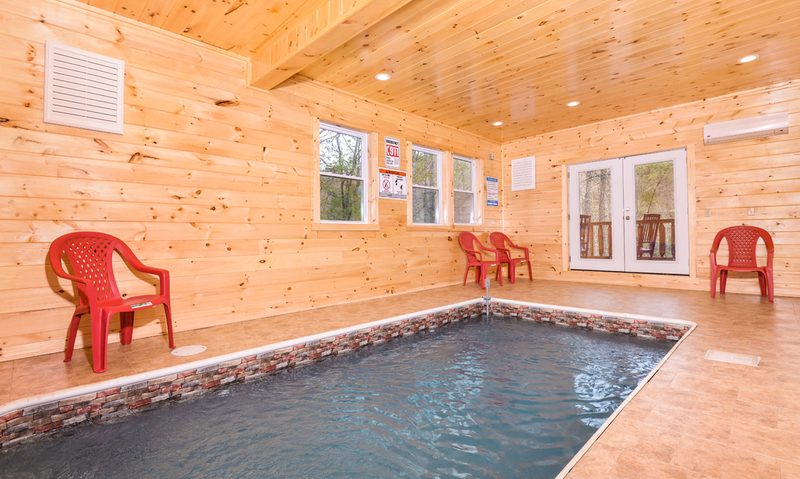 A private indoor pool provides a great place to cool off and splash around in the comfort of your own cabin. 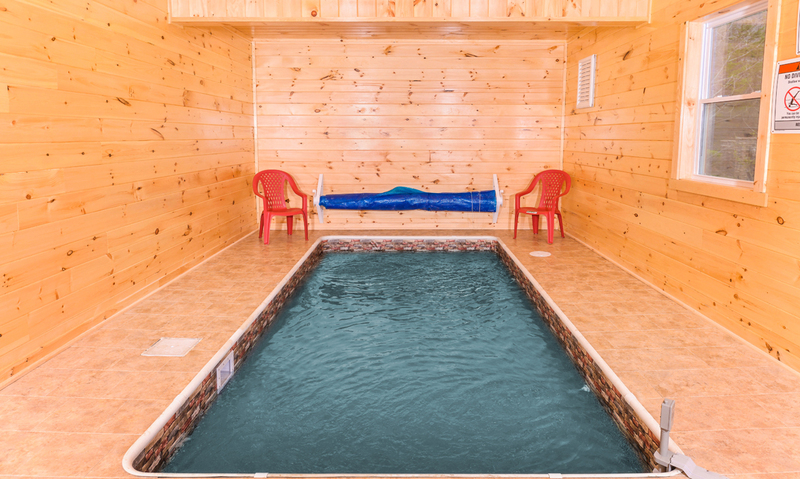 Splish Splash also offers high speed wireless Internet, making it easy to find upcoming events in the area or plan out your meals and fun stops in town. 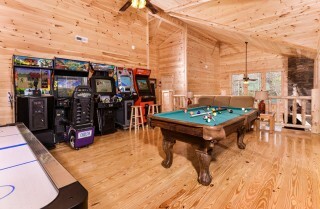 If you prefer a more active way to pass the time, this five bedroom Pigeon Forge cabin also features several games. 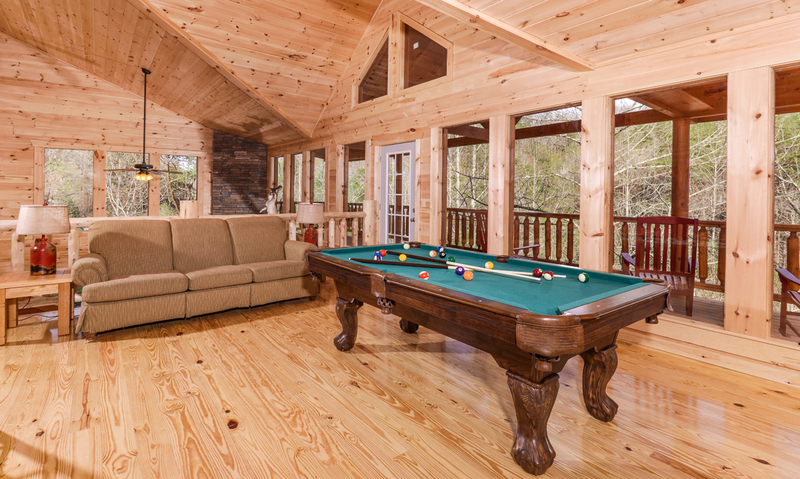 Play air hockey or a game of pool in the comfort of your own cabin! 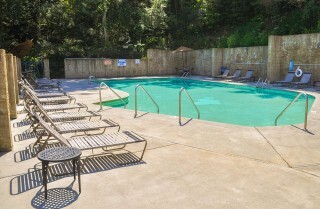 And with a location in Sherwood Forest, you also have access to a community pool – great for cooling off during the hot summer days! If you need some fresh air, head out onto the decks and enjoy the views of the mountains and woods. 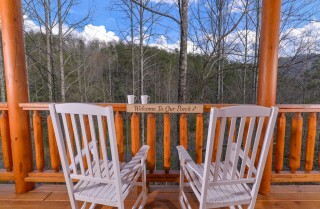 There are rocking chairs where you can sit and have a cup of coffee or a glass of wine as you relax. Other comforts include the washer and dryer, which are great for longer stays. 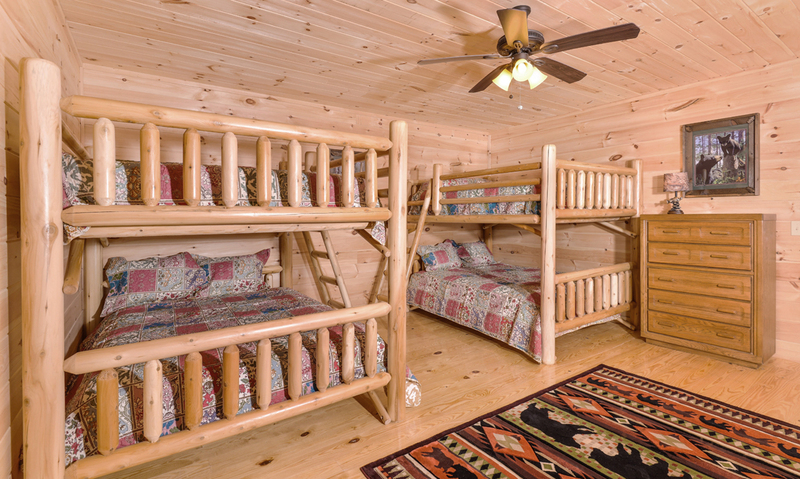 You can pack light and just toss in a load or two as you go. 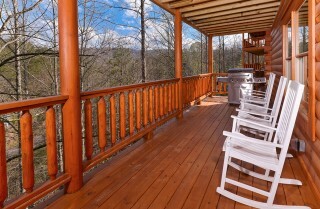 Outside, the paved driveway with six parking spaces and a ramp up to the cabin makes arrivals easy. With lots of great amenities, the conveniences you enjoy at home, and a location near exciting Pigeon Forge, Splish Splash is a wonderful group getaway. 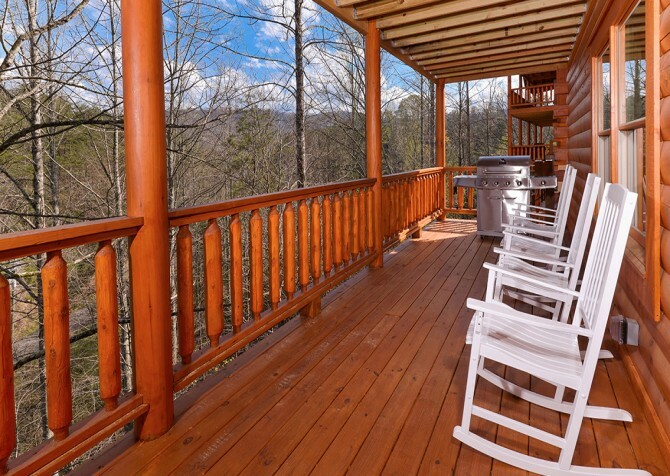 You’ll find plenty to do in town and in the cabin, and you’ll have lots of spaces to kick back and relax as you soak up the serenity of the Great Smoky Mountains. 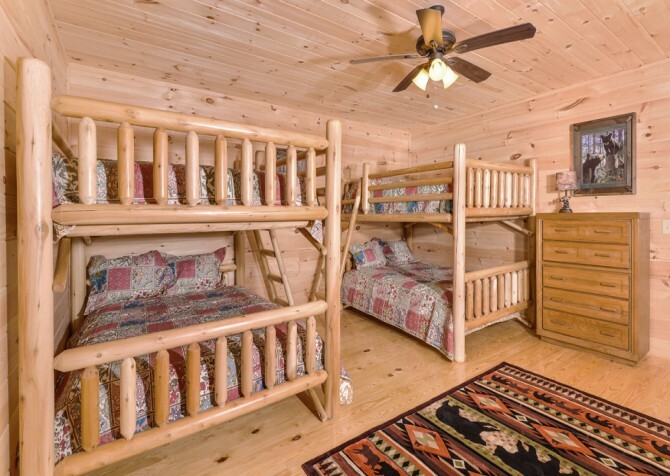 "This is second year at the same cabin. 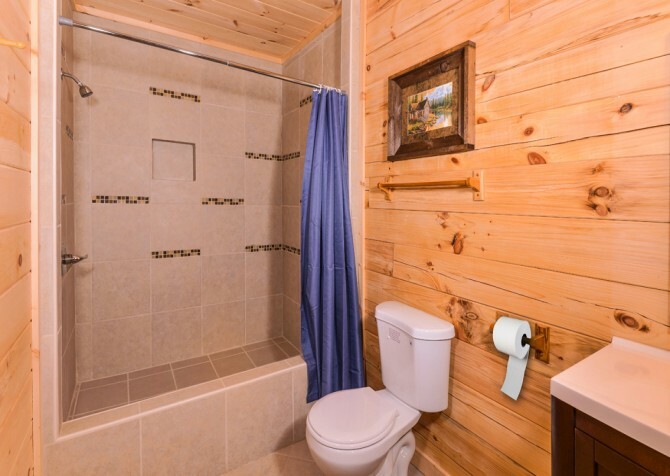 We've used Cabins For You several years and never had an issue. 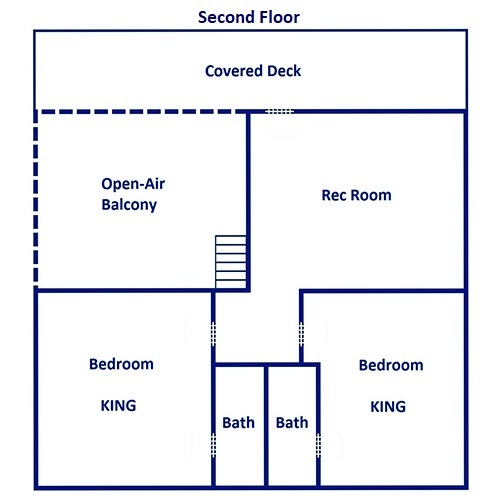 They are responsive when contacted. 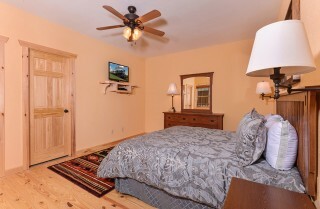 We always get the information for check-in as promised a few days prior to the date. 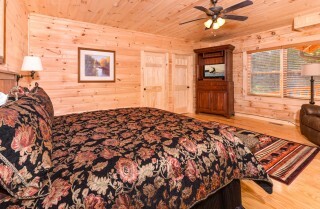 Love the check-in and check-out using the cabin telephone rather than having to go to an office location. 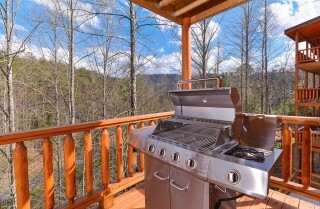 Will continue to use them."